We are continuing to crunch our way through the AC1200 routers pouring in. On the test bench today is Edimax' BR-6478AC AC1200 Wireless Concurrent Dual-Band Gigabit Router. Edimax isn't a company that usually springs to mind for cutting edge products. So why this review? The table below shows the reason. 802.11ac isn't even released yet and we already have multiple companies battling it out for your router budget at well below $100. With an Amazon price of $70 as I write this, the BR-6478AC currently beats the next most expensive TRENDnet TEW-811DRU by $10. At that price point, you’d expect to give up some features, and you’d be right. The Edimax router is a very basic router that lacks a USB port, so there are no file or printer sharing features. So the real question becomes, “How well does it perform?” Actually, surprisingly well, as you'll see when we review performance later on. If you’re a fan of LEDs, you’ll like the front panel of the BR-6478AC. Bucking the minimalist trend found on D-Link routers, the front panel of the Edimax router is loaded with LEDs. The chart below summarizes the LEDs and functions. I personally like front panel indicators, as they provide basic status with just a quick glance. The BR-6478AC has link and activity indicators for the WAN and the four Gigabit LAN ports. Unfortunately, the LEDs are single color, so there’s no link rate indicator. There are individual LEDs for each wireless band, power indicator and internet connection indicator. There’s nothing too exceptional about the rear of the router. You have a power port for 5V DC and color-coded ports for the Gigabit WAN and the four LAN ports. The WPS button also doubles as the reset button – you just hold it in longer for a factory reset. Interestingly, there’s a Radio On/Off switch which lets you disable all wireless functions without having to log into the device. The Edimax router is one of the few routers that is still using a pair of external 3 dBi dual-band antennas. Many manufacturers have moved the antennas either to the PCB or inside the case. These antennas are firmly affixed to the router and not upgradeable, however. Finally, you’ll note that above the Ethernet ports, there are some cooling holes that provides convection cooling from the holes on the bottom of the router. Setup of the BR-6478AC is fairly simple. Edimax has joined other manufacturers in having a “No-CD” setup. Though there is a CD included with the product, it contains only the User Manual and a Multi-Language Quick Installation Guide. 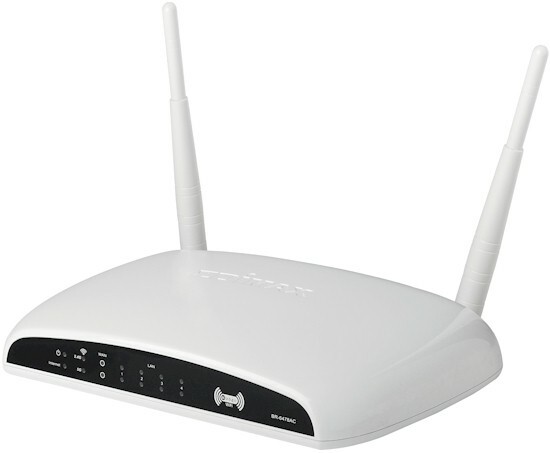 Unlike many manufacturers that instruct you to connect an Ethernet cable between your computer and one of the LAN ports, the setup on the Edimax is wireless. The QIG instructs you to connect an Ethernet cable to your modem, and then search for a wireless network named edimax.setup. (Edimax uses the same SSID on both the 2.4GHz and the 5GHz bands.) There is no wireless security for the setup process, so you should be able to easily connect to the router. Next, you are instructed to browse to http://edimax.setup. When you connect to the router, you encounter a first-run wizard that guides you through the rest of the setup. Feel free to scroll through the setup gallery below if you‘re interested in the individual steps. The router will try to connect automatically to the internet. You may be prompted for additional credentials if you have a PPPoE connection. Confirmation of wireless settings is shown and you are given the option to backup the new configuration.